Hey, y'all! Some of these photos are new, while others were on Facebook earlier this week! 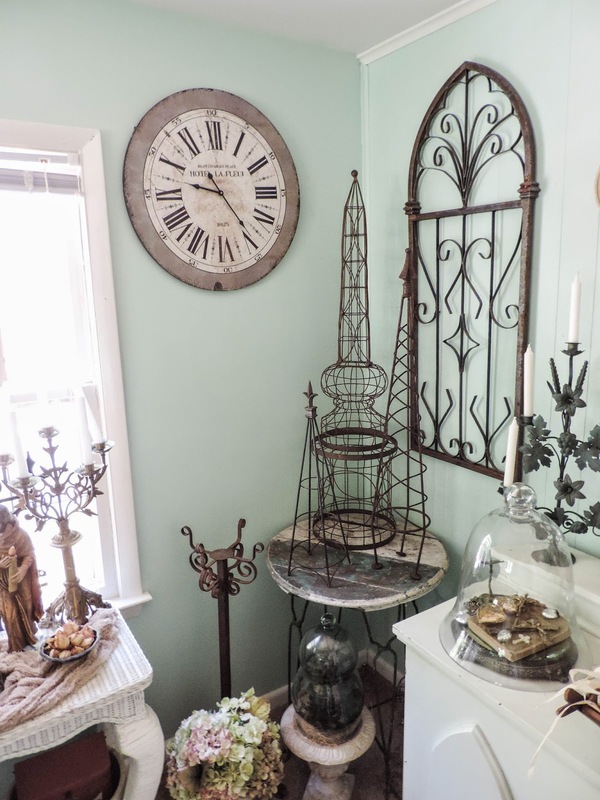 Be sure to pop over to www.Facebook.com/ShabbyFrenchCottage and like me there to stay up to date! Anyway, here are some brand new photos of my dining room! 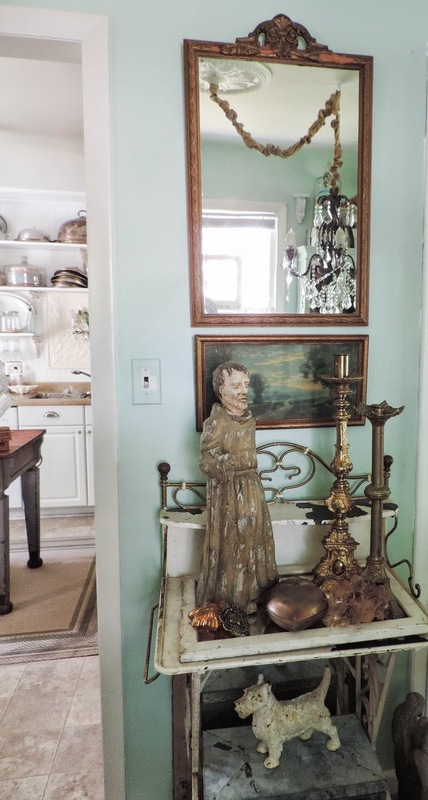 I called this post "Communion with the Saints" because a good portion of the religious items I collect are in this room. Heck--my side board is a communion table. I love all of the whites and greys with pops of rust! 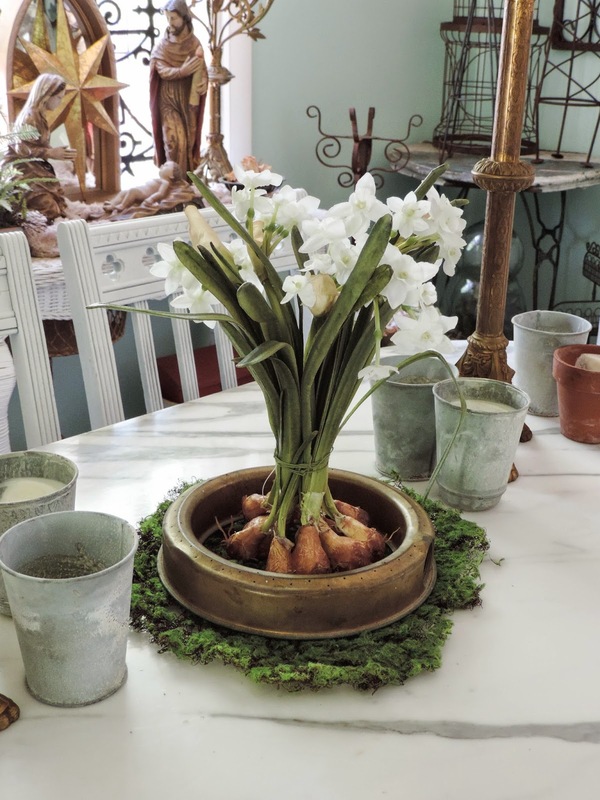 This marble top table is a French brasserie table. I picked it up in my hometown of Petersburg, VA! The side chairs came from an estate sale. I painted them and recovered the seats with painter's drop cloth from the hardware store. 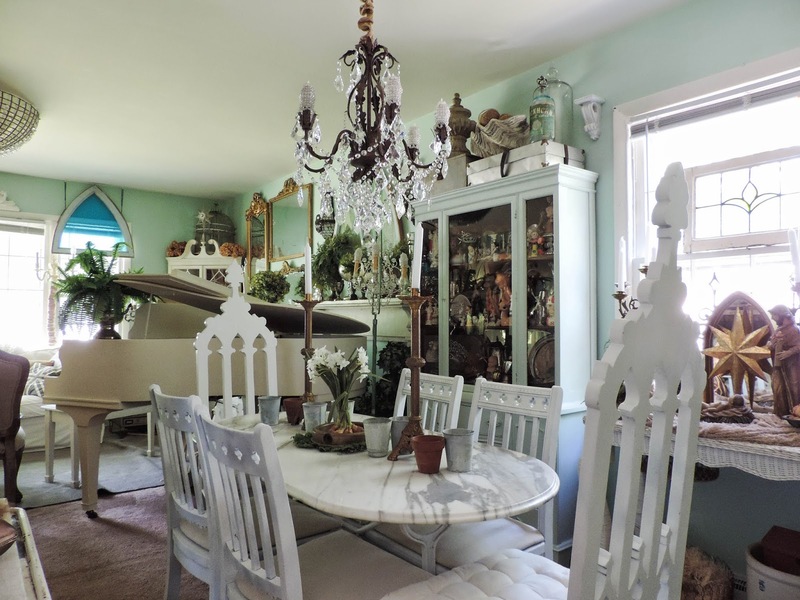 The two large Gothic chairs were a gift from a dear friend. I also painted them. 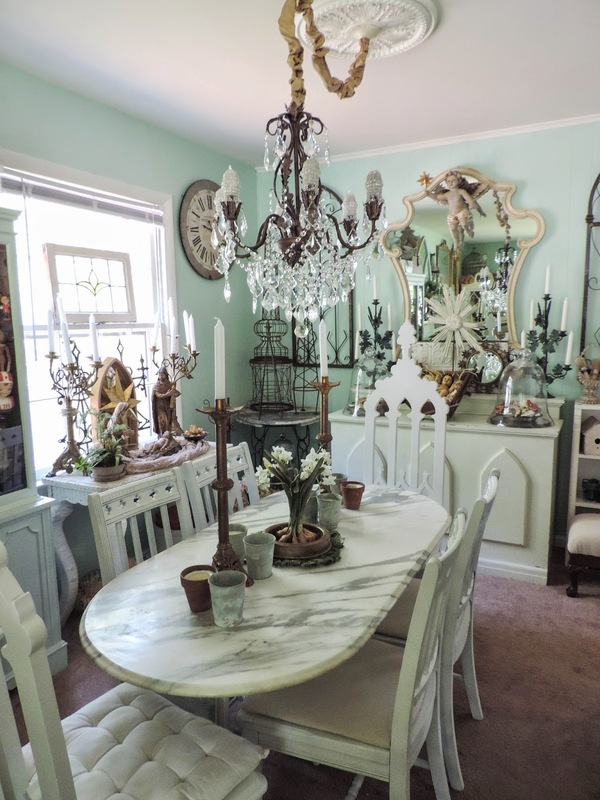 I bought the two altar candlesticks at Petersburg Pickers. Petersburg Pickers is one of the largest Estate Liquidation firms in my area. I say this because I know--I work there full time as operations manager! We run three day Estate Tag Sales out of our 10,000 square foot warehouse every other Thursday - Saturday! Find out more here. The faux flowers, vintage sprinkler, and faux moss came from a previous sale! Another view of my dining room looking towards the living room. You can see a glimpse of the altar table that is my server/sideboard. The chandelier was an $89.00 hardware store find. 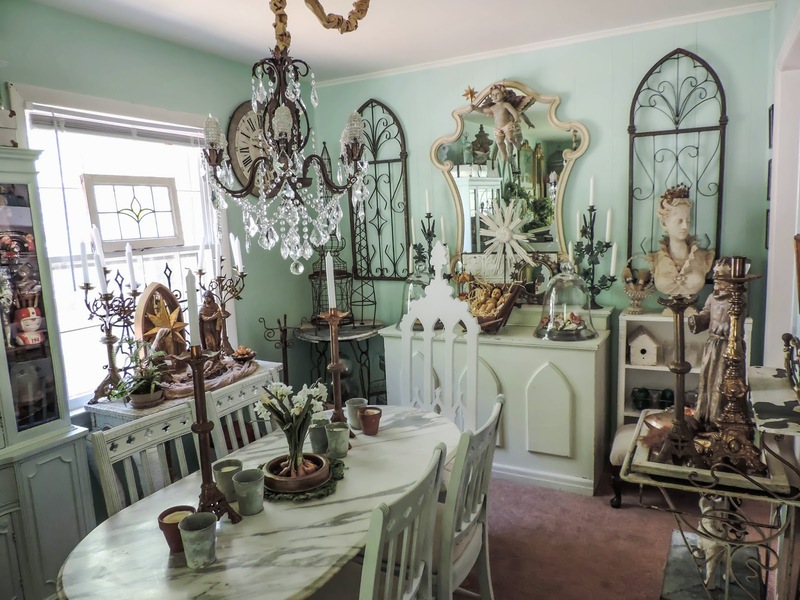 On top of religious items, I also have quite a few garden items in this room! I love these topiary forms! They make quite an impression, and help fill the void--I put my Christmas tree in this corner, and it seems so bare when I take it down! Here, a French wash stand doubles as a bar/server. I have placed a favorite Santos, several sacred hearts and some altar candlesticks on it. There is also a petite glimpse into my kitchen. I will have new and updated photos to share soon! 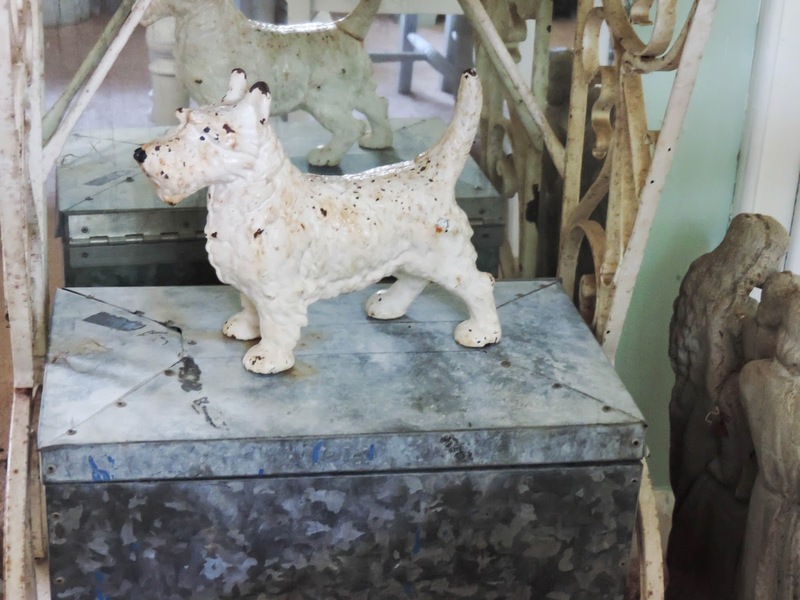 Underneath, a fabulous cast iron Scottie stands on an antique milk box.